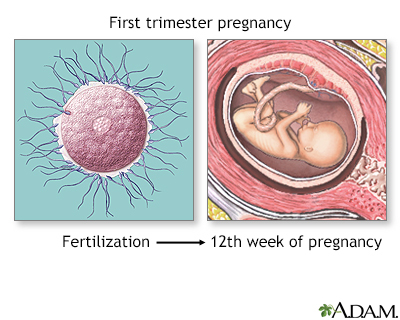 The first trimester of pregnancy is the first three months after conception. Signs of early pregnancy are missed menstrual periods, fatigue, breast enlargement, abdominal distention, and nausea. During this period of time all organ development takes place so the fetus is most susceptible to damage from toxins, drugs, and infections. Studies show that an increase in the mother's dietary folic acid before conception and during the first month of pregnancy reduces the risk of having a child with a neural tube defect. 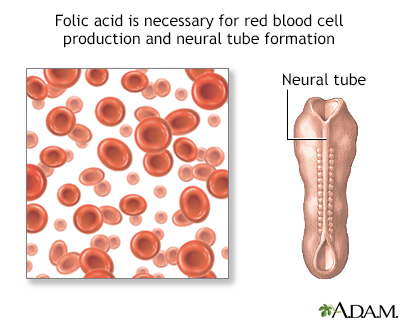 The recommendation is that women of childbearing years take a daily folic acid supplement. The first trimester of a pregnancy is a time of incredible growth and development. 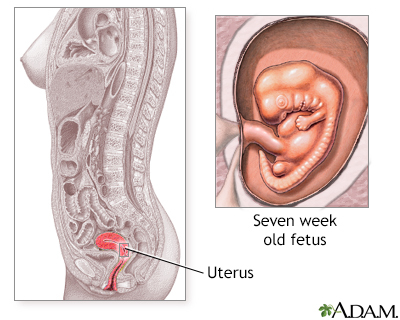 A 7-week fetus will have begun to develop all essential organs. Reviewed By: Anita Sit, MD, Department of OB/GYN, Santa Clara Valley Medical Center, San Jose, CA (for identification purposes only). Also reviewed by David Zieve, MD, MHA, Medical Director, Brenda Conaway, Editorial Director, and the A.D.A.M. Editorial team.